Save the Dates Are Out! We just sent out our first batch of Save the Dates this week, in hopes that everyone will get them before Christmas. We’ll still have to mail a few later as we get the rest of the addresses for everyone, but we wanted to get the most of them out as soon as we could! On the right is a picture of Alexa attaching one of our amazing address labels to the envelope – I think this one was for her grandparents. 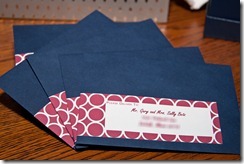 But we couldn’t just stop at having cool cards, we had to do something fun for the addressing, too. Alexa had read about these Martha Stewart-inspired wraparound labels on a few wedding blogs she follows, so off we went to the craft store to figure out how to make them. Well, really, she convinced me to stop there on the way home from work, and I spent 20 minutes attempting to figure out what kind of paper a label should be printed on. 3 hours of fighting with Word’s mail merge feature later, we had some awesome labels printed, cut, sent through a Xyron 250 Sticker Maker, and voila! We’ll post the template we made in a future blog entry so others can make them, too! The design on the label is inspired by 1960’s-era typography and a bold modern-retro background. After watching Mad Men and loving the fashion and style of the 1960’s that it illustrates, we realized that would be the inspiration for the look and feel of our wedding (wow, that felt like a UI design discussion…). We use the term “swanky elegance” to describe the atmosphere we’re going for. It’s not really a theme per se, but more of the bit of inspiration we’re using to help us envision our wedding. 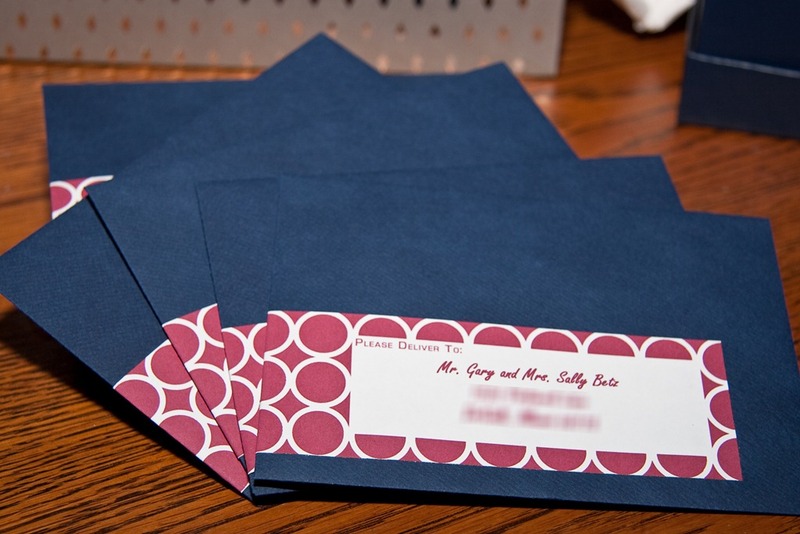 Anyway, I don’t want to go into that too much right now, so I’ll leave you with a quick shot (on the left) of some of the finished save the date envelopes, from just before we put on the stamps and dropped them at the post office. We hope you look forward to getting yours in the mail!